Assembling your own DIY Harley Quinn costume this Halloween? We totally support that! She's rocked a lot of styles over the years, and has a different theme in the comics, in animated series, and, of course, in the movies like Suicide Squad. So, we think it's a-okay if you'd like to put your own spin on Harley. 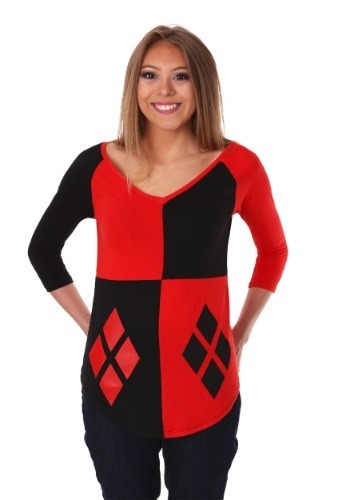 A great choice for a simple Harley Quinn costume style would be building a look around this DC Comics Women's Harley Quinn Diamond Raglan. You could wear it with cutoffs and some wicked makeup. Or with leggings and jester hat! Hey, it's your costume, so we think you should put whatever spin you like on it. This Women's Harley Quinn Diamond Raglan is DC Comics officially licensed. It 50% cotton and 50% percent polyester with raglan sleeves, a wide v-neck, and a swooping apron hem. Alternating black and red panels and printed diamonds give it the signature harlequin style. Of course, it doesn't always have to be about costumes. This shirt is great for everyday wear, too! We're all about costumes here, of course, but we fully support fun fan apparel, too. And if you're looking to show off a little comic book fan style, this Harley Quinn shirt would be a perfect choice.